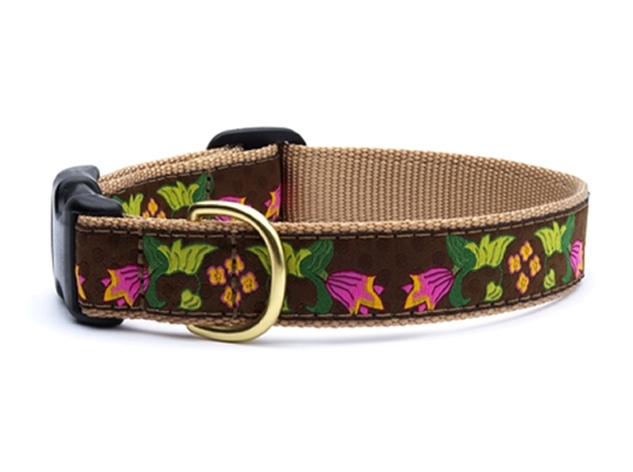 The Up Country Chocolate Floral Dog Collar is made of high tensile nylon with a fray and stain resistant ribbon sewn onto the nylon making the collar strong. The collar can be adjusted for the perfect fit. Machine washable. Made in the USA. Beautiful collar and so well-made -- so much more interesting and delightful than most collars I've seen at pet stores. Also, Five Barking Dogs has been a pleasure to trade with. Responsive, speedy, with terrific selection!